I first had a typewriter when I was about eight years old. It wasn't a retro, romantic pastel one. It was an electronic one from the eighties. But my mum gave it to me and from then on I set about becoming a writer. A few years later my parents invested in a PC where I discovered newsletter templates in MS Word, as well as clip art. That was it, I was a pro, creating my own newspaper for all of the world to read. And now, it seems over the past few years, the world has once again fallen in love with the typewriter. Maybe it was the rise of Mad Men that drew our attention back to these beautiful pieces of machinery, now made redundant by technology. There's a romanticism about them that makes you think you could sit down and let your fingers run over the keys whilst you pen your best selling novel. And of course, beautifully styled photography, cute illustrations and retro imagery all add to that! 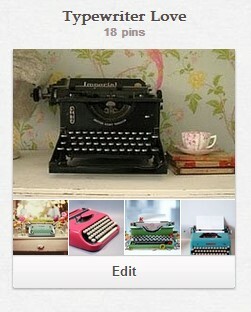 You'll have seen by my previous post, that I still love typewriters, so to celebrate, I created a Typewriter Love board on Pinterest. Click on the image to go straight there!